I had the opportunity to watch ‘The Blind Side’ two months ago and was pleasantly surprised with what I found. Full disclosure, I tend to really enjoy Sandra Bullock’s movies, despite a few misses that failed to draw my interest (Premonition comes to mind.) I had high hopes going into this movie, though I had no idea what to expect. The movie is based on the book The Blind Side: Evolution of a Game by Michael Lewis, which is on one hand a look at the left tackle position in football and on the other hand, a biography about Michael Oher, who was put into foster care homes very early, running from one foster home to another, and going from school to school. His mother was addicted to drugs and his father, murdered. This movie focuses on Michael’s entrance to upper class Christian school (though in real life – Briarcrest Christian School) and his life after his fateful meeting with the Touhy family, and ultimately, his involvement in football. From the moment the movie began, it drew you in. The trailers have portrayed the movie as being very dramatic, but upon viewing, I found it to be quite funny, heart warming, and inspirational all at once. A dramedy. 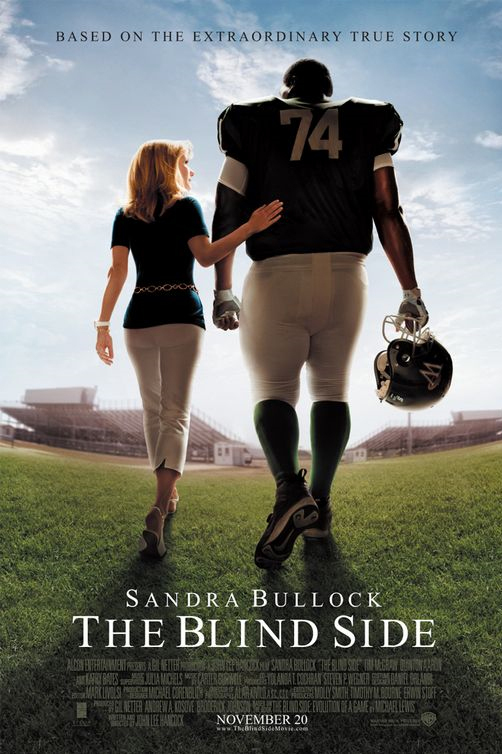 If this story had not been based on a true story, I could see how many people who are cynical would find it to be cliche, unbelievable, and claim that “The Blind Side” is yet another “Hollywood” film. Put your cynicism aside, and enjoy the telling of a true and inspirational story. Sandra plays Leigh-Ann Touhy, who is sassy, smart, emotional, but most importantly, a person who was able to do what many of us would not be able to do – bring an essential stranger from off the street into their home, and give them the love that they deserve. Then there’s Michael Oher, played by Quinton Aaron, who seemed almost untouched by his previous turbulent situation. One might expect him to be violent, bad, with no morals given his upbringing, but surprisingly he is the opposite. Though one could easily see that the Touhys have given Oher a new direction in life, Oher changes the Touhys lives in the most positive way. The acting in this fim was top-notch. I can honestly say that this movie would not have been the same had Bullock not played Leigh-Ann Touhy. She’s one of the rare actresses who can pull off being sassy and loveable at the time and get away with it, as we saw in the “The Proposal”. I try to think of one person who could have played her part as well as she did and I can’t come up with anyone else. The supporting cast was extremely strong, which is the glue that made the movie as enjoyable and smooth as it is. I barely recognized Tim McGraw, who plays the supporting husband of Sean Touhy. Jae Head, who played little S.J. really stole some of the scenes away from Quinton Aaron. For those who are curious, there is a great deal of football action in this film, as Michael Oher was just drafted for the NHL this season, for the Baltimore Ravens. If you’re looking for an inspirational film that can make you laugh and cry, look no further. This has the perfect mixture of sport, drama, love, and comedy in this little gem, and it is so well done. I don’t usually cry during movies, but this one made me tear up over and over again. John Lee Hancock has a hit on his hands. My only reservation in the success in numbers for “The Blind Side” is that it goes head to head with Twilight’s “New Moon” the same day – one I’m pretty sure it will lose. Despite this, I hope audiences do not overlook this film and head to the theatre to watch it. I saw the intended finished product earlier this week and did not detect any obvious changes, except for the music and the wonderful addition of pictures of Michael Oher and the Touhys during the credits, so the movie essentially is still the same and is just as good.